Deadly diseases such as Ebola and avian flu can jump between animals and humans. Vets can stop the next big outbreak before it's too late. "Anything that dropped dead on our grounds got necropsied, and I pursued a diagnosis," says McNamara, now a professor at Western University. McNamara had a mystery: What was killing the birds? "I already knew that we were not dealing with anything known to veterinary medicine," she says. "It was something new. And then when I heard that people were dying of an unusual encephalitis, I'm like, 'Oh, there's a link.' " That September, several residents of New York City had contracted and died of a similar illness. The West Nile story is important. It is also the story of avian flu, rabies, MERS, HIV, SARS, anthrax, and Ebola. The common thread: These are all illnesses that can be passed from animals to humans. "Often, infectious diseases circulate in animals for a long time before they cause outbreaks in humans," says Wondwossen Gebreyes, the director of Global Health Programs and a professor of molecular epidemiology at Ohio State University. "To prevent disease in humans, we should be able to address what's happening in the animal world and what is happening in the environment," Gebreyes says. Human and animal health are irrevocably linked. As a veterinarian, he says, "I've always been interested in saving human lives." Africa has the most to gain from a united medical front. 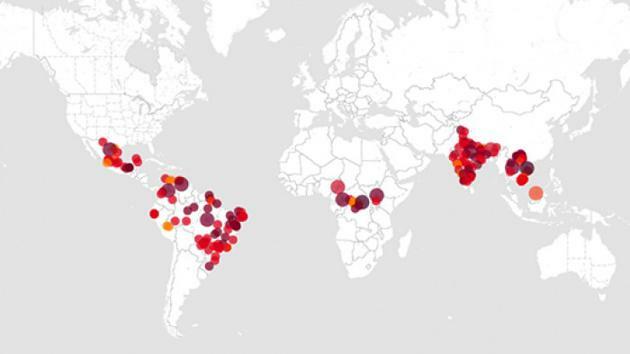 Much of the continent is a hot spot for zoonotic disease—urbanization into biodiverse areas increases the chances for viral spillover. Combine that with poor health systems, unregulated bush meat economies, and poor veterinary systems, and the emergence of new diseases on the continent is not that surprising. So how do you find the next Ebola, the next rabies, the next West Nile before it comes to infect humans? You actively look for it in the wild. That's what the University of California (Davis) is doing by deploying teams of veterinarians into zoonotic hot spots around the world—in Africa, Asia, Central America, and South America—to detect outbreaks in animal populations before they get out of control. Through their Predict initiative, funded through USAID, they also empower local governments by giving them the tools to detect and diagnose strains without having to ship samples abroad. "We're looking for viruses in viral families that have had a lot of zoonotic diseases, especially ones that have high pandemic potential—viruses like influenza, viruses like MERS, flaviviruses [e.g., encephalitis]," Christine Kreuder Johnson, a U.C. Davis veterinarian and epidemiologist, says. In 2012, the U.C. Davis group encountered five dead howler monkeys in Boliva. The team immediately collected samples, ran diagnostics, and discovered a deadly strain of zoonotic yellow fever in the necropsies. That triggered a comprehensive response from the Bolivian government. "Before any human cases could develop, [the Bolivian government] implemented a vaccination campaign, public outreach to talk about the situation so that people knew to avoid mosquitos, and a mosquito-control effort," Johnson says. "There were zero human cases." With greater surveillance of wildlife diseases, Johnson says it's possible we find out that the spillover of animal viruses to humans is far more common than we currently realize. Viruses have been evolving without detection in animals for thousands of years. And humans are pushing farther and farther into natural habitats. "It's just a matter of chance that some of those viruses will be able to find the right pathway to emerge in people," she says. In 2000, what was then the U.S. General Accounting Office released a critical report on the West Nile outbreak response. "A consensus that the bird and human outbreaks were linked, which was a key to identifying the correct source, took time to develop and was initially dismissed by many involved in the investigation," it read. "Better communication is needed among public health agencies." Regardless, when N.Y. officials initially misdiagnosed the human outbreak as St. Louis encephalitis, they activated mosquito control and probably saved lives. But what if it wasn't a mosquito disease, and for three weeks CDC was fighting the wrong virus without any success? "One Health is the future," Behravesh says. "If I'm working on a salmonella outbreak, I might talk to the USDA's national veterinary services laboratory to see what they are seeing. Those sorts of things happen every day." While CDC is the primary agency on these issues, the surveillance of animal disease is still scattered across the bureaucracy. The USDA monitors livestock but not wild animals. The Interior Department has a National Wildlife Health Center in Madison, Wis., but that lab has a research staff of around 30, a number McNamara says isn't large enough for truly national disease surveillance. "I don't think you'd have a repeat of what happened 15 years ago," McNamara says. But she's still worried there isn't enough coordination among the agencies. Funding discrepancies abound. Comparatively, "there is very little research going on in animal diseases," Princeton's Kahn, who cofounded the One Health Initiative, an informational resource, says. The national research budget for human diseases is $29 billion. The USDA's National Institute of Food and Agriculture has a total budget of $783 million, none of which is specifically budgeted for animal health research. If detecting disease threats from wildlife is a difficult prospect for the United States, what can we expect from the developing world? The current Ebola outbreak will subside, but the question remains: Will the public health authorities in West Africa be stronger or weaker in its wake? In a globalized world, health needs to be a globalized effort. This article has been updated to more accurately reflect the number of research staff employed at the National Wildlife Health Center in Madison, Wis.